During her doctoral work in maternal-child health and epidemiology at the University of Illinois at Chicago, Diana Grigsby-Toussaint became interested in the social, environmental, and neighborhood influences on childhood diabetes. Much of the existing research focused on juvenile onset diabetes. Because of the obesity epidemic, however, more cases of what used to be called adult onset diabetes are being diagnosed in children, adolescents in particular. 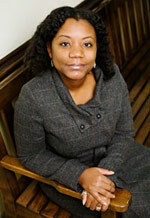 Dr. Grigsby-Toussaint says this has led to a change in nomenclature, where diabetes is no longer referred to as juvenile or adult onset, but as Type 1, a viral or autoimmune disorder in which the body does not produce enough insulin, and Type 2, in which the body’s insulin is unable to move sugar out of the bloodstream efficiently. Type 2 is related to physical inactivity and obesity. "The concern with Type 2 diabetes in children is the prolonged period of time with the condition, the higher burden it will place on the health care system, and the lower quality of life these children will have," she said. Through her research, Dr. Grigsby-Toussaint is hoping to increase understanding of the socioenvironmental influences that need to be addressed in order to have effective interventions and sustainable change. She is a co-investigator with the interdisciplinary Strong Kids research program focused on childhood health and obesity. Dr. Grigsby-Toussaint and others are examining risk factors for obesity in preschool children, an ideal time for shaping healthy behaviors that will protect them as they grow older. She is collecting data on family mealtime patterns, physical activity habits, cultural influences on food choices and the availability of preferred foods in neighborhood stores, and other socioenvironmental factors. Eventually, researchers hope to develop evidence-based prevention and intervention programs for families and children that promote healthy development.